As a parent you don't have to be a scientist or have a college degree to help your child learn science. It is much more important to take the time to observe and learn with your child than to be able to give technical explanations of how things work. How you view and talk about any subject can influence your child's attitudes toward that subject. You can’t make your child like science but you can certainly encourage them to enjoy learning about it and to appreciate its value in every day life. Science involves observing, exploring and asking questions about living things, materials and phenomena. Children develop the thinking skills and practical abilities to be able to carry out investigations. Key Stage 1: This is when children learn about bulbs, wires and simple series circuits containing batteries. This is also where they learn about everyday electrical appliances. At home you can encourage your child to list all the things they can find that use electricity. Discuss the function of switches and how they can turn the flow of electricity on or off. 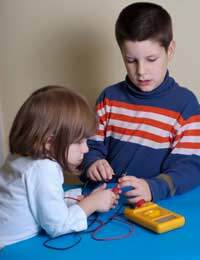 At Key Stage 2 your child will learn about circuits and the components of a circuit for instance bulbs, wires and batteries. They will also be learning how to draw simple circuits. There are many great explanations and activities on the subject of circuits available on the Internet. Look at some of the explanations together and discuss them so that your child has a clearer understanding of circuits and how they work. At Key Stage 3 your child’s knowledge of electricity and other science topics will be getting more sophisticated. At this stage they will be combining electricity, circuits and magnets to design their own circuits and investigate electromagnets. You could research electromagnets on the Internet and help your child to make an electromagnet at home. At Key Stage 4 Science is divided into two programs of study – Single Science and Double Science. Alternatively they can choose to study Biology, Chemistry or Physics as separate subjects. The topics studied in Single Science and Double Science are mostly the same but in Double Science are studied in more depth. Electricity is studied as part of both. Encourage your child to ask questions and discuss their ideas. This will help their confidence in their own thinking and will encourage their interest in Science. Provide your child with opportunities for simple, hands-on investigations. You can find plenty of ideas for experiments on the Internet or in Science books. There are many great children’s Science books available in your local library or bookstore. Choose activities that are age appropriate. If you choose an activity that is too difficult your child may get the idea that Science is too hard. Try to make it relevant. Science is used in day-to-day life and you can help encourage this in your child by discussing news issues that deal with science topics, or by discussing science that is encountered during the course of the day. Science is a wonderful subject, which can provide your child with many key skills like observation, teamwork, communication and problem solving. Encouraging your child to appreciate the enjoyment and applicability of science in your everyday lives can be simple and fun.